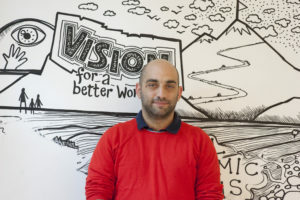 Aris Papadopoulos is the CEO at LATRA, an applied-innovation agency specializing on mobilizing the Creative Industries at the frontlines of global humanitarian and environmental challenges. Responding to the world’s currently largest humanitarian crisis, in 2015 LATRA established an applied-innovation research hub inside a refugee camp in Lesvos-Greece, specializing in sustainable development, cultural diplomacy, creative entrepreneurship and tech-driven environmental resilience. LATRA has produced projects in Greece, Sweden, Norway, the Netherlands, the United Kingdom, South Africa & Qatar, and its work has been financed by the European Commission, the European Cultural Foundation, European Union National Institutes of Culture, the Nordic Council of Ministers, the Creative Industries Fund Netherlands and others. Aris graduated as an architect from the Architectural Association School of Architecture in London and holds an MSc in the Management & Economics of Innovation from University College London.